Wondering what you can eat when you have braces on your teeth? Those first few months in braces can be painful and challenging, especially if you have headgear, elastics, or spacers. Well, there's more to life than just soup and smoothies, so grab this book and get cookin'! The Braces Cookbook was created by an enterprising teenager in braces, with help from her mom (a published author of parenting books). There are more than 50 mouth-watering bracket-friendly recipes sure to satisfy even the pickiest appetites. In addition, there are Substitution Specials (such as how to make your own soft twisty pretzels, and work-arounds for beef jerky and caramel apples). 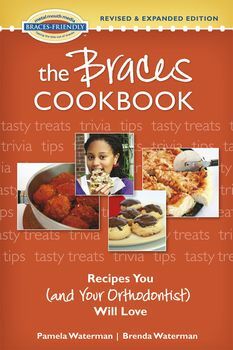 More than just a book of recipes, The Braces Cookbook contains coping tips, dental trivia, and suggestions for dining out and pampering your sore teeth on the most challenging days. This well-organized book is spiral bound for easy access in your kitchen. The recipes are simple enough for a child to follow with help from a parent. There's even a place for you to write your own recipe notes. A great gift for a friend or loved one in braces! Contains 50 delicious recipes, as well as coping tips and dental trivia. Both this cookbook, and its followup (The Braces Cookbook 2) are invaluable to people who are new in braces. On our ArchWired.com message board, one of the most frequently asked questions is: My mouth hurts! What can I eat?! This cookbook helps answer that question with ease.